Conference "Highs and Lows of European Integration"
The School of International Studies organizes and supports many research activities in the field of European and international studies. These activities are predominantly characterized by a multidisciplinary and interdisciplinary approach. The School of International Studies develops multidisciplinary research activities addressing the challenges associated with the processes of globalization and European integration. The complexity of modern societies implies that no single disciplinary approach is sufficient to understand the rapid social, political, economic and institutional changes currently occurring both in Europe and worldwide, therefore the activities feature predominantly a multidisciplinary approach. 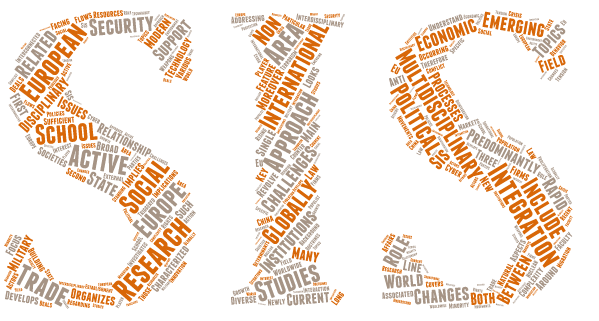 Research activities at SIS revolve around three main broad topics. The first line of research looks at the social, political, institutional and economic implications of a globally interconnected world. Building on the diverse disciplinary background of the faculty, research in this area investigates various aspects of trade integration such as the behavior of firms in international markets, the relationship between trade and natural resources, and the trade-related determinants of anti-establishment movements. Moreover, the research activities focus on the challenges facing international law in a globalized world and on the emergence of China as a new key player in international affairs. A second active area of research deals with international relations and security, and their interaction with technology and innovation. Specific topics of research include cyber-security and counter-terrorism, non-proliferation of nuclear weapons, the relationship between military doctrines and military technology, the changing role of international institutions, state and non-state actors in conflict situations. Moreover, the research covers newly emerging security issues regarding the environment, population growth and migration flows. The School of International Studies has a long-standing research interest in European issues, in particular those related with the tension between integration and disintegration, and with the social and institutional challenges triggered by the recent economic crisis. Current research in this area includes the rising support for populist parties, the protection of minority rights across Europe, the role of subnational entitities in the European integration, the EU external action, and the evolution of economic policies in Europe. The most recent publications by the Faculty Members of the School of International Studies are available here. The School has been actively involved in a series of research projects funded both internally and externally, augmenting the scientific activity of its group of young, qualified and dynamic researchers. Anti-establishment Voting and Economic Integration. The Reform of the Chinese Growth Model: Economic, Political and Institutional Issues. Crisis in the European Union: between Transnational Integration and National Disintegration. The School has formed partnerships with a number of national and international research centres and think tanks as well as with other Departments and Faculties within the University of Trento. It has set up special programmes for meeting and hosting national and international scholars. During the academic year, the School organizes a series of events. It holds a series of weekly seminars on issues relating to European and international studies, including international security, and promotes Conferences and Research Workshops. It also collaborates with other local, national and international research bodies to set up dissemination events and to promote research.